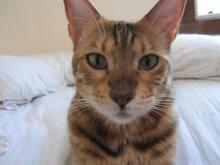 Sarabi is a 5 year old bengal cat. She is very playful, vocal, and affectionate. She and her best pal and companion, Bird (the cat) love to play together! One day Sarabi stopped eating, drinking, and going to her litterbox. Her ‘mom’ rushed her to the vet for a series of tests and xrays. On the third day, she had a fever and it was determined that she needed emergency surgery. In surgery, they discovered that something she ate had punctured her colon and formed a fast growing internal abscess. The costs for veterinary care and medications skyrocketed and there was concern she might not survive. Sarabi’s mom was able to pay for much of Sarabi’s surgery but her funds ran out and she was not able to cover all of Sarabi’s overnight care and medical treatment. Birchbark Foundation was able to step in and authorize an emergency stipend to Associate Member hospital VCA Santa Cruz. Sarabi was able to get the care she needed and she is quickly on the mend. Sarabi’s mom, Mariah is so grateful to have her baby back!